Rie Ogura in New York Theatre Ballet's Dark Elegies. Photo by Darial Sneed. BOTTOM LINE: A tribute to Antony Tudor's earlier choreography and how it changed the ballet world. New York Theatre Ballet: Legends program includes a full evening of Antony Tudor’s (1909-1987) dances with one work that was almost lost forever. Together with dance archivist Norton Owen, Trio Con Brio was reconstructed. Their two year painstaking process of learning from an old hand crank film is proof of their commitment to the Tudor works and their exquisite place in the history of dance. A small piece of the video was destroyed and the additional choreography by Lance Westergard, a Tudor disciple, is well placed and keeps with the rhythm and tone of the piece. Artistic Director Diana Byer has a broad vision for NYTB of how it can further the preservation of the past and show us how relevant the work still is. This selection of Tudor’s choreography is all his earlier works from his twenties. Most of the dances were originally performed in smaller houses and seeing them in Florence Gould Hall, was akin to how they were first shown. The dancers brought these rarely performed pieces of work back to life with vivacity and determination. Pianist Michael Scales matched the dancers in exactitude and enthusiasm in Trio Con Brio and Judgment in Paris. As academic as Trio Con Brio is, Judgment of Paris is the opposite, hilariously entertaining. The three female dancers, including Diana Byer, compete for a gentleman’s attention in a burlesque style show. We saw the range of Tudor’s mind from Jardin aux Lilas, about entering an unhappy marriage and betrayal, to the quick pace and solos by the strong men Steven Melendez and Choong Hoon Lee in Trio Con Brio, and the gags in Judgment of Paris. 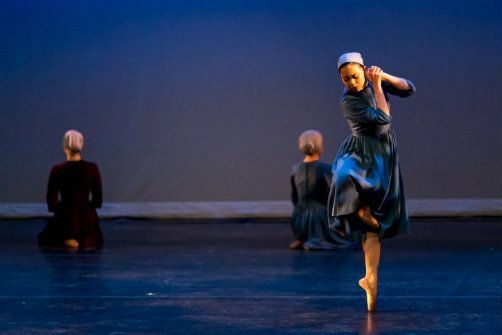 To end the evening on a completely different end of the spectrum, Dark Elegies, a piece about the mourning of a tight knit community felt like a modern dance piece with the rounded and tormented shapes coming in and out of balletic lines. There was a pulse through the piece with "Kindertotenlieder" by Gustav Mahler setting a somber and serious landscape. The female dancers moved so articulately that the ones wearing pointe shoes did not even seem as if they were. These dancers truly transcended their bodies in this masterpiece. It is touching without much sentimentality and the end is hypnotic and gentle. The gestures of a hand holding the other arm demonstrate pain but geometrically. What we saw here is how beautifully simple the transitions are. You barely saw people enter and leave the stage and at moments it felt like you were watching a kaleidoscope move with beautiful dancers making clock-like movements inside. Antony Tudor was a Zen Buddhist and you can see the efficiency of his choreography. It has so many influences on ballet today. His dramatic and abstract work in Dark Elegies showed what a story ballet could be. It is a pleasure to see this spectrum of his work. If you have no idea who he is, know that every important ballet dancer of the 20th century was raised on his work and check it out.